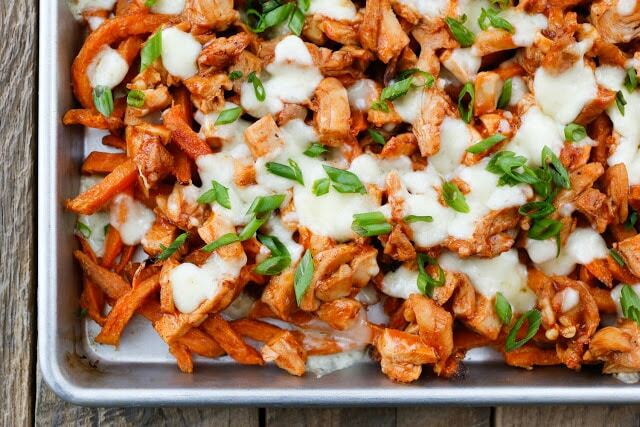 BBQ Chicken and Cheese Curd Fries start with a layer of crisp french fries. 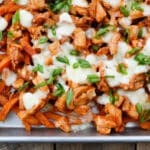 The hot fries are piled with saucy barbecue chicken and topped with melting cheese and fresh green onion. This very simple meal is another spur of the moment dinner that turned out even better than I’d hoped. We have several go-to barbecue sauces that we eat regularly. (I just can’t play favorites between them!) 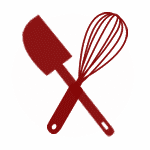 Classic Sweet and Spicy Barbecue Sauce was my choice for this recipe because I already had a jar of it in the refrigerator. However, if you’d like a little more heat than sweet, try this Spicy Barbecue Sauce. Looking for a little more southern tang in your sauce? Try the Tangy Memphis Barbecue Sauce. Want something a little off the beaten path? Sriracha Bourbon Barbecue Sauce is a spicy, rich, slightly smoky sauce that is sure to impress. Or, if it’s more your style, just pick up a bottle of your favorite. Absolutely any barbecue sauce that you love will work with this recipe. Want to make your own sweet potato fries? Try this recipe for guaranteed crispy baked sweet potato fries. Alternatively, you can make your own crispy baked matchstick fries or how about these crispy veggie fries? Kitchen Tip: I use this pan to make this recipe. Grill or broil the chicken thighs with 1 1/2 cups barbecue sauce. See this recipe for oven-broiling instructions. When the chicken has finished cooking, let it cool for at least 5 minutes before chopping into 1/2-inch to 3/4-inch pieces. Drizzle the chopped chicken with the remaining barbecue sauce, to make it nice and saucy. While the chicken is cooking on the grill, or while it is cooling from the oven, heat the oven to the manufacturer's suggested temperature (usually 425°F) and cook your french fries. Stir once or twice to ensure they are crispy all around. 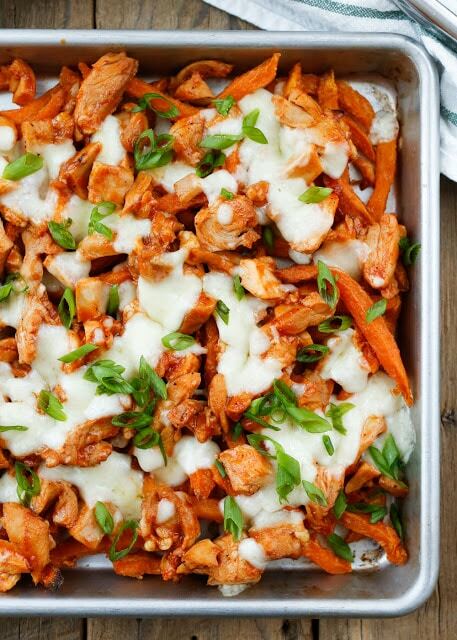 Remove the fries from the oven, top with chopped chicken and sprinkle cheese curds evenly across the pan. Place back in the hot oven for 5-6 minutes, until the cheese has melted. Sprinkle with green onions before servings. Enjoy! I typically choose sweet potato fries because they are my weakness and I love them. If you prefer classic fries, feel free to use them. If you're more of a baked potato person, simply chop up cooked potatoes and layer the ingredients over the top. There is no wrong way to make this meal. Trust me, I've made them all! Cheese curds can be a little tricky to track down, but I can almost always find them at Sprouts and at Costco. You can substitute 1/2-inch cubes of Monterey jack or mild cheddar if you absolutely can not find cheese curds, however, it's really worth it to look for the cheese curds. The chewy, melting combination of the hot cheese curds is like no other cheese I have ever tasted! Yum! These are right up my alley. I would have to keep from eating the whole tray! Good grief! My guys would die of happiness. First, though, they'd have to get through me and I'd be an enormous, fierce obstacle that would keep them from getting to it because I would want to eat it all myself, first. I am sooo making this!!! Thanks for sharing it!